Flood Victim? Can I See Some Propiska? In addition to meager victim compensation, the frontlines appear to be replete with the very bureaucratic runarounds Tymoshenko warned against. Narrator: Today the first precedent occurred. Newcomers were required to show passports with propiska. Lilia Ivanova is one of those who failed to show her ID. Lilia Ivanova: We lost it. I took my black bag, that bag. I left this black bag with my ID and instead I took this one. Narrator: Evacuation center employees are outraged at this order coming from the top. They say there’s hasn’t been a huge supply of free riders. Relief worker: People who have no electricity, no water, no gas, people who have already consumed whatever food supplies they had and came to have some warm meal, I believe that in this case, the passport should…it’s not the sort of document that should be required of them. In the USSR, propiska served as a system of residence registration that severely restricted freedom of movement and employment opportunities. Despite being outlawed by the Constitutional Court of Ukraine in 2001, propiska and internal passports remain very much in use. Priest-Interpreter: Mr. President, let me thank you again with all my heart. Opposition leader Viktor Yanukovych: Thank you. I hope this faux pas doesn’t become a self-fulfilling prophecy. Otherwise, hell would freeze over before the Ukrainian Orthodox Church would gain canonical status. At least 30 people, including 6 children, perished after heavy rain flooded western Ukraine, namely Lviv, Zakarpattya, Ternopil and Chernivtsi oblasts. President Yushchenko: The disaster we’ve encountered is the number one issue in Ukraine today. Premier Tymoshenko: We will fully compensate you for all the loss. We are now convening, here, in Ivano-Frankivsk oblast, a meeting of the government. We are putting together all the money that is now held in the emergency fund and is held in other accounts that are on hand. Tabloid has pictures of helicopter mom Tymoshenko flying over the flooded areas. Ecumenical Patriarch Bartholomew I of Constantinople today arrived in Kyiv to celebrate the 1020th anniversary of the baptism of Kyivan Rus. The visit came amid tensions stirred by the Russian Orthodox Church, which considers Ukraine its canonical territory, even though the baptism of Kyivan Rus predates the founding of Moscow. Patriarch Bartholomew I, accompanied by President Yushchenko, who supports the Ukrainian Orthodox Church, laid wreaths at the monuments to Princess Olha and St. Volodymyr. It is the first time a Constantinople Patriarch visits Kyiv since 1648, and while Constantinople does not yet recognize the Ukrainian Orthodox Church, President Yushchenko sees the visit as a positive signal. Text: Believe in yourself! Don’t risk your personal freedom! Voiceover: Every year, thousands of Ukrainians are suffering from human trafficking. Even if you’re in trouble, there is hope. A human is not a commodity. Call and get help. Text: A campaign to combat human trafficking. Call toll-free (for calls in Ukraine). Prosecutor-General Oleksandr Medvedko: The prosecution has gone through injustice and has saved its moral face. Let me emphasize that this is being made possible through our people, who, on a daily basis, carry out their job duties with dignity. And therefore, at today’s meeting, I’d say the successes in prosecutorial activities and the present shortcomings and failures are a mirror image of appointment decisions. Should we call that moral face “see no evil, hear no evil?” Why do we have a zero conviction policy in high-profile white-collar crime cases? As Prosecutor-General in a country that ranks 118th on the Corruption Perceptions Index, why do you wear a $10,000 watch? Has Ukraine’s GDP per capita already reached $10,000? Unique proposition? Work abroad? High pay? Voiceover: Every year, thousands of Ukrainians are suffering from human trafficking. Don’t risk your personal freedom. Before you leave the country, consult us. Voiceover: Believe in yourself. A human is not a commodity. A campaign to combat human trafficking. Call toll-free (for calls in Ukraine). Voiceover: The State Employment Agency. Jobseeker: Hi, I’m dreaming of a job, too! Voiceover: For real help, call toll-free 24/7. Nice try! But be-all-you-can-be creativity does not always translate into credibility as long as the cross-country income differential remains so large. Try luring all those blue-collar workers back from Italy, Spain, Portugal and Russia, where they earn in a week what the Ukrainian market pays in several months. As always, President Yushchenko positions himself as a believer. July 26, 11:00 a.m., Sophia Cathedral, Sophiyska Ploshcha and Mykhailivska Ploshcha. 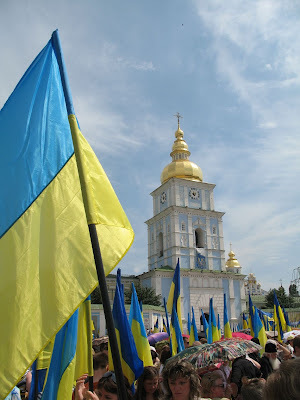 For the unity of all Christians of Ukraine! Ecumenical Patriarch Bartholomew, Ukrainian President Viktor Yushchenko, representatives of the worldwide Orthodox faith. State celebrations of the 1020th anniversary of the baptism of Kyivan Rus. Reporter Serhiy Leshchenko: The interrogation lasted six hours. The previous one lasted 7 hours 20 minutes. But it’s normal practice in Yushchenko’s poisoning case. Interrogations are quite lengthy. During the interrogation, I couldn’t help but start drawing the interrogation procedure. Because this was the first time, the one that lasted 7 hours 20 minutes, here’s the investigator, here’s me, and here’s the place from which he interrogated me. But the interrogator didn’t see it during the first time. During the second time the interrogator saw me drawing him and told me to destroy the drawing. That’s why I failed to save it. But I did manage to draw the landscape outside the window at the Office of the Prosecutor-General. Here it is, looking kind of industrial. It’s a pity because in eight…in eight hours, in six hours, one could go to London and arrest all Yushchenko's poisoners and fly back. A few weeks ago, Leshchenko did an interview with beleaguered Davyd Zhvania in which Yushchenko’s friend-turned-foe once again denied the dioxin poisoning claim. After Ukrayinska Pravda published the interview, Leshchenko ended up escorted by law enforcement to the Office of the Prosecutor-General. Yushchenko reportedly suspects Zhvania of having a role in his poisoning, but his press service has issued a statement criticizing the strongarm treatment of Leshchenko. Narrator: A grand and a half. That's the price she put on her son. It’s not the first time that the 30-year old mommy dumps her kids. She left her first-born in the maternity hospital. As for her second child, the 4-year-old Maksym, she decided, as she puts it, not to torture him and just sell him. Mother: Because he [the buyer] told me that he [my son] will go to good people, that he’ll be in rich people’s hands, that he’ll be living out there in America, and so that uh… that I wouldn’t have to suffer with him. He told…he first gave me an advance of 100 dollars and then, today, he gave me these fifteen 100-dollar bills. Narrator: The woman was caught red-handed during the transaction. Criminal charges are now being brought against her. In the few days that the kid has spent at the shelter, nobody has made inquiries about him. Relatives never called and never came. Among the fifteen kids in his group, he clearly looks lost and depressed. Reporter: Maksymchyk [diminutive], who brought you here? Maksym: Mom…police. I want to go home. Narrator: During the three months that Maksym Malyuk will be spending in the children’s shelter, his mother will most likely have her paternal rights revoked. And the future of the kid depends on whether he will find a real family someday. Kids, chanting in chorus: G-o-o-d-b-y-e! Valentyna Semenyuk-Samsonenko, head of the State Property Fund: I harbor no bias, and the Fund harbors no bias, toward [Arcelor] Mittal Steel. We equally treat everyone who came to Ukraine with investments. If you assume obligations, you should deliver. If you don’t deliver, you’ll be parted with your respective entity. Last year, we repossessed 35 such entities. It’s no big deal. Having, so far, fended off an attempt by PM Tymoshenko to sack her, Mrs. Semenyuk-Samsonenko has reinforced her buy-hold-sell prerogative with a policy of who’s-your-mama. Not only does Semenyuk-Samsonenko bounce the privatization deals sought by Tymoshenko, but she also seeks to pull the rug from under the deal that Tymoshenko considers her personal triumph. In 2005, the resale of Kryvorizhstal in a live-broadcast open-bid auction fetched a record price of $4.8B, becoming the only transparent transaction in Ukraine’s history of murky privatization deals governed by cronyism and favoritism. Since then, experts believe, the market value of the steel mill has increased manifold. What’s done is done. Unless ArcelorMittal fails to meet the terms and conditions of the sales agreement, its property rights must not be violated. And given Semenyuk-Samsonenko’s agenda, the public has the right to know the facts, just the facts. An article in ePravda (Ukr) cites ArcelorMittal’s failure to pay out dividends to the State Property Fund, which retains a 7% stake in the steel mill. The SPI also claims that the company management has not improved working and housing conditions as stipulated by the agreement. Semenyuk-Samsonenko, the article continues, has voiced plans to divorce ArcelorMittal from its asset, and has asked the government to cover litigation costs. At the same time, the article argues that Semenyuk-Samsonenko's move is primarily a crusade against Tymoshenko. Watch Tymoshenko reflect on the stress coping technique she exhibited while awaiting a vote of no confidence on Friday. The vote failed to gain enough support. Reporter: Yulia Volodymyrivna [patronymic], yesterday the whole country saw how you jammed your fingers with a piece of stationery. Did you really feel that nervous or is it just a habit, perhaps a bad habit? Do you often do things like that? PM Yulia Tymoshenko: Well, taking into account that the Government has its fingers constantly jammed in the doorway, I was training myself to get used to pain. Karl Rove, Bob Shrum, Dominique Strauss-Kahn, Tony Blair, Aleksander Kwaśniewski, Viktor Chernomyrdin. What brings these cosmocrats together? In the absence of clear and measurable achievements in brining Ukraine closer to Europe, YES continues to operate largely as a personal PR program of Ukraine’s second-richest man (net worth: $8.8B). This self-promotional philosophy manifests itself in Pinchuk’s other initiatives, e.g. importing world-class performers Elton John and Paul McCartney to Kyiv for free concerts. The fifth annual YES talkathon will feature discussions of food, energy, trade, and Ukraine’s European aspirations. So when will Ukraine become an EU member? Is it 2020? Or has the target date been revised to 2030 or 2040 or 2050? If you press the flesh, drink champaign and share your vacation plans, will it add any value to Ukrainian society? 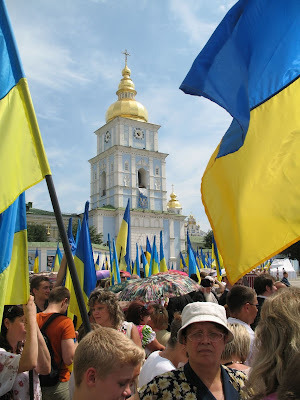 If you talk the talk as Ukraine’s population continues to dwindle — with a life expectancy of 67.7 years and a net loss of almost 7 million people in 17 years — it will be ordinary Ukrainians who will walk the walk. They will vote with their feet. On July 9, 2008, Viktor Yanukovych celebrated his 58th anniversary. MP Borys Kolesnikov, PRU: Well, Viktor Fiodorovich...Viktor Fiodorovich [patronymic transliterated from Russian] once loved to go hunting and fishing, that’s speaking of hobbies. Everyone…everyone will act depending on their imagination and financial capabilities, I think. MP Anatoliy Tolstoukhov, PRU: And it’s not hunting gear that will prevail, but, say, landscapes, paintings. MP Hanna Herman, PRU: I presented Viktor Fedorovych [patronymic transliterated from Ukrainian] with a portrait of his mother. We searched for a long time and finally found an old photograph. I magnified it and fit it into a frame, and today I put it on the leader’s table. MP Leonid Hrach, CPU: Well, there’s no gift that a poor person could present to a rich one. MP Oleh Lyashko, BYuT: Well, obviously some of the leaders will greet him, but you do realize that, in reality, it’s all a game. They greet each other in public, they smile, but in reality they everyone looks for ways to nail each other. Valeriy Heletey, chief of the Ukrainian Secret Service (UDO): All the people who are under protection…we always come to terms and we always greet people on their birthdays. We always wish that they would feel secure and comfortable. Kyiv Mayor Leonid Chernovetsky: I don’t…I don’t have any such things. I have nothing. I can even show you my pockets. Mr. Hrach, Mr. Chernovetsky, you guys are incredible! Tabloid has a picture report of the event. Voiceover: Ukraine’s has long been searching for a center that would unite the efforts of many patriots to achieve a common goal. Kyiv, July 12: The United Center Convention. United Center! Caption: United Center, grassroots support. Not only does this ad mess with the mind of the audience, but it also messes up the timeline. Ukraine declared independence in 1991, not in 1990 as shown in the above timeline. On July 16, 1990, Ukraine declared sovereignty while remaining a part of the Soviet Union. Ukraine would not declare independence until August 24, 1991. The blue-yellow Ukrainian national flag made its way to the floor of the Verkhovna Rada on August 23, 1991, not in 1992 as the timeline says. And why portray Ukraine’s accession into the WTO by running a picture of U.S. Ambassador William Taylor delivering a speech at an ACC event? Now let’s set the record straight on the United Center. What does United Center stand for? United Center stands for United Center of Shyrka, or Yushchenko’s grand coalition with certain members of the Party of Regions. Speaking of narodna opora, (grassroots support), narodna omana (grassroots deceit) would sound much more coherent. Or how about “The grass is greener on the Regions' side, now that we’ve pissed away the Orange Revolution?" 90 minutes that gather together fans. Two times that bond teams. One championship that unites the nation. A step into Europe is made with a football boot. Under the blue-yellow banner, let us welcome the entire European community! Let’s get together. Because we deserve it. The road to Euro 2012 is a step into Europe! The Terminator-like voiceover can be identified as the Party of Regions’ tub-thumping tone during the September 2007 parliamentary campaign. With Ukraine close to getting the boot from the UEFA over poor preparations, why not look on the bright side of life? After all, if you own real estate in, say, Monte Carlo, you're already in Europe, right? Presidential candidate Viktor Yushchenko: My slogan: “I believe, I know, we can.” I say “I believe” because I believe in Ukraine. I believe in every one of us. I believe that we will build a state where everyone will be proud to say: “Yes, it’s my Ukraine.” I say “I know” because I know my responsibility. My deeds should benefit everyone, regardless of whether they like Yushchenko or not. I say “I know” because I know what to do. I proved that at the National Bank and as Prime Minister of Ukraine. I say “we can”: “we can” is the will and inspiration of each and all of us. Together, we can do everything. There are millions of us, and our people are talented. We have the richest soil and a glorious history. We can live human lives. Everyone will be able to make a decent living for themselves and their children by doing lawful work. We will build a fair and humane society. We will bring about the changes that every Ukrainian has been waiting for so long. The strong will support the weak; the rich will help the poor. Voiceover: Yushchenko will win! Everyone of us will win. And there will be changes! The government fears change. We’re being convinced that everything’s fine. Just don’t change anything. Voiceover: Let’s rid Ukraine of the bandits. It’s our chance and our responsibility. On November 21, come to the polls and vote as your conscience tells you. Every vote for Yushchenko is one more “no” to the unbridled bandits. Let’s protect our families and our future. Yes to Yushchenko! On November 21, all honest people will come to the polls and will serve justice to the bandits. Goodbye the country where greedy oligarchs, shameless officials, and smalltime scoundrels prosper. Hello New Ukraine, a Ukraine of prosperity and love! May goodness dwell in our hearts and souls! Peace to our home! Yushchenko is running for president. And Yushchenko will win! Presidential candidate Viktor Yushchenko: I believe in Ukraine. I know my responsibility. I believe, I know, we can. Voiceover: Yushchenko! Peace to you! This ad aims to raise public awareness of Ukraine’s risk of losing the Euro 2012 hosting rights for failure to keep the schedule of preparations. The commercial premiered a few weeks ago on Inter, the channel that hosts Savik Shuster’s Svoboda talk show. Three of the people receiving the kick with their rears can be identified as President Yushchenko (center), NSDC Secretary Raisa Bohatyryova (right) and Prime Minister Yulia Tymoshenko (left). MP Andriy Shevchenko, BYuT: I think the time has come when a very clear stance should be taken by the President of Ukraine, Viktor Yushchenko. We haven’t heard a clear stance during the last couple of weeks, and I’m sure that everything that’s been going on with the Coalition could be completely resolved if the President so desired. Let me say this again: It’s enough for Viktor Yushchenko to so much as move a finger to have, for instance, [defectors] Rybakov and But vote together with the Coalition. This [the Orange Coalition’s near-disbandment] wouldn’t have happened without the stance currently taken by the Presidential Secretariat. That’s why I very much expect, I very much hope, that the President will not remove himself from this process. If this Government, this Coalition, really matter to him, then there should be support. Right now, this support is needed. If not, then maybe the President should honestly say that he has opted for a grand coalition with Viktor Yanukovych. And I think Yulia Tymoshenko will then have the full moral right to start her own personal presidential campaign and to call on all the people who voted for Yushchenko in 2004 to support her.